The Ammo (Mini) Nut Wizard by Holt's gets its name because it is very popular with firearms enthusiasts. It is perfect for collecting brass casings, smaller acorns and other small nuts. Metal wires form a basket that easily rolls on the ground, and the easy spin motion prevents backpedaling. The wires are pliable and spread open so that, as you roll, it collects the nuts from the ground. Once the nuts are in the roller, you won't have to worry about the nuts falling out of the basket and back on to the ground. Of all the nut picker-uppers we have tried, the Holt's products prove to be the best. 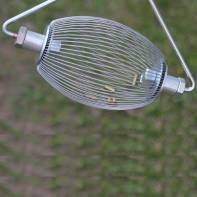 Pair with the Small Wire Dumper for extra convenience when emptying your Ammo (Mini) Nut Wizard. Attach the dumper to a 5 gallon bucket then fix the Nut Wizard over the dumper to set your collected nuts free.